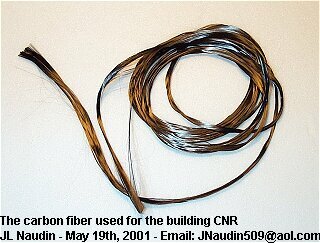 The original CNR design consisted in two 6 mm strips of 7 micrometer unidirectional carbon fiber which have been previously pressed ( at 1.4 MPa ) together and glued with epoxy cement in a crossply configuration to form a 6x6 mm junction. In the CNR diagram above, the top lamina is AB and the bottom lamina is CD. The voltage difference between the two laminas in the junction has been measured across B and C and the current flows from A to C with a standard resistor ( R1 ) connected in serie. 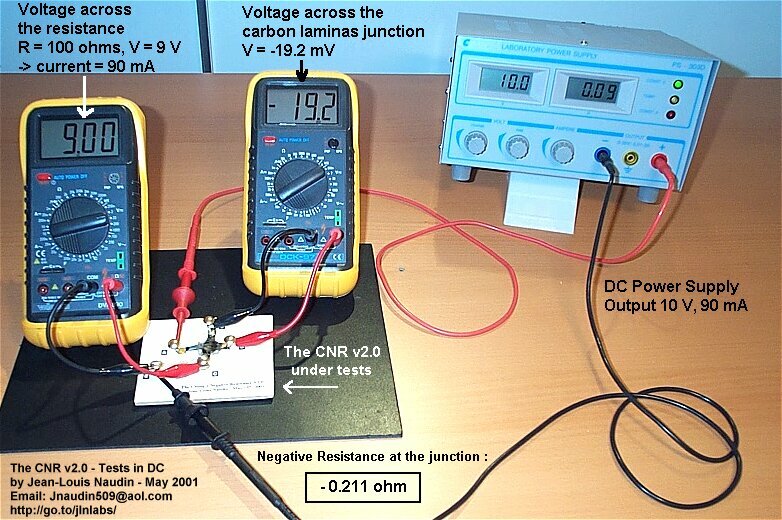 A Keithley 2001 multimeter has been used during this experiment. The electrical current was calculated by Ohm's Law ( I = U(R1) / R1 ). 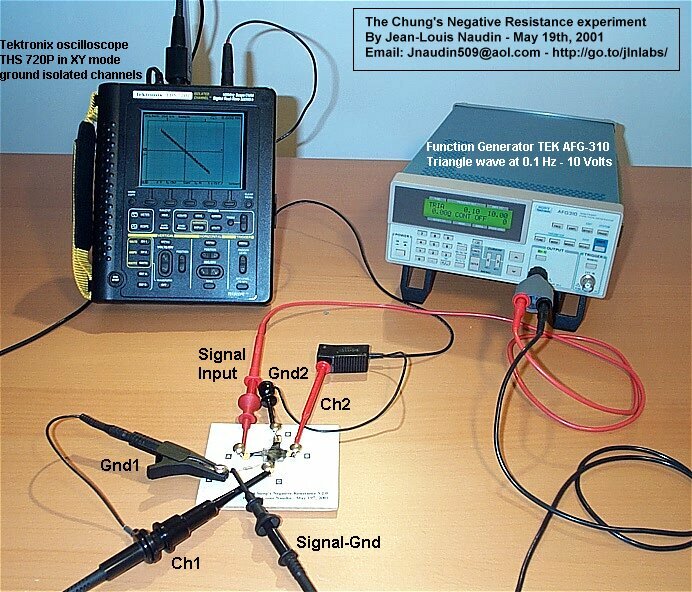 An apparent negative resistance has been measured at the junction : the current-voltage characterictic was a straight line with a negative slope through the origin. The electrons, in the junction, seemed to travel in the unexpected direction ( backflow ) according to the voltage gradient. For more informations and technical datas read this PDF document : "Apparent negative electrical resistance in carbon fiber composites," by Shoukai Wang and D.D.L. Chung - Composites, Part B, Vol. 30, 1999, p. 579-590. 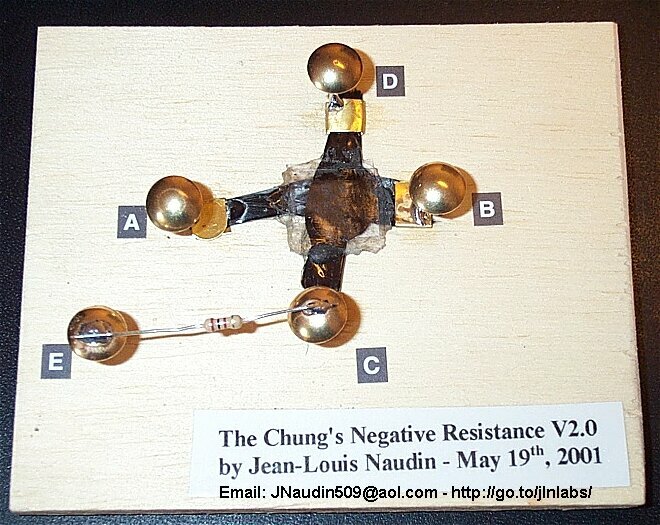 The first CNR v1.0 device has been built according to the description done in the Dr Chung's paper cited above. I have used two similar strips of carbon fiber (see the photo below ) glued with epoxy in a cross shape. The slope of the Current-Voltage curve was POSITIVE and thus the measured resistance junction was POSITIVE. 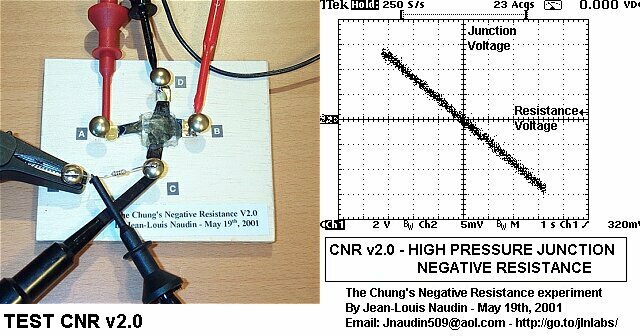 The measured current changed from -60mA to +60mA and the measured voltage across the CNR junction changed from -40mV to +40mV at a rate of 0.1 Hz. The first CNR v2.0 device has been built with the same method than the v1.0, but the junction pressure has been strongly increased comparing to the previous version during the gluing phase with the epoxy cement (see the photo below ). The blue curve shows the voltage measured across Resistor ( R1=98.7 ohms ). 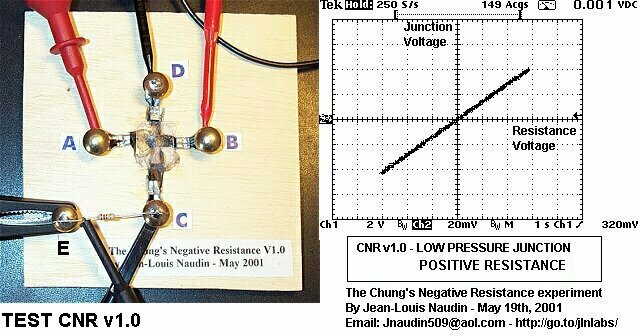 The slope of the Current-Voltage curve was NEGATIVE and thus the measured resistance junction was NEGATIVE. The measured current changed from -64mA to +64mA and the measured voltage across the CNR junction changed from -14mV to +14mV at a rate of 0.1 Hz. The results are now very encouraging, today, I can confirm experimentaly the "Negative Resistance" discovered by Dr. Chung in 1998. 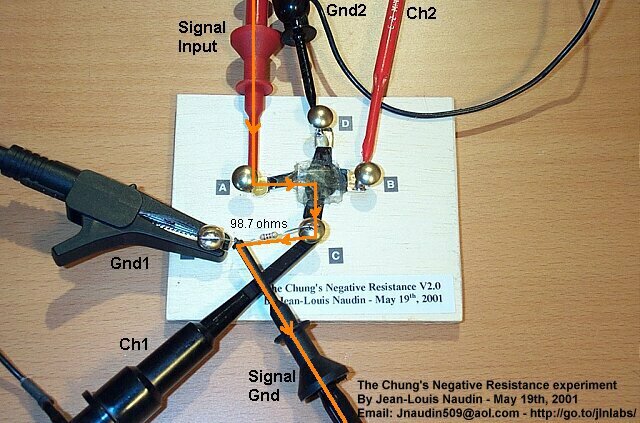 It is interesting to know that Dr Chung and Wang have demonstrated negative resistance as low as -8 ohms for a contact area of one square centimetre. The CNR is an "apparent" Negative resistance rather than a true resistance. Its mechanism seems equivalent to a true negative resistance because the electrons flow in the unexpected direction relative to the applied current/voltage and this occurs only in the junction between the two carbon fiber laminas, the XY section showed in my 3D diagram. The equivalent model of the CNR can be easily simulated by a computer and the interesting fact to observe is that a negative value for the Rneg must be set for getting the same result than the working unit. In the CNR experiment presented here, the most important fact is that we have a solid state and a static device where we can observe easily an electron backflow in its junction. Dr Chung has said in his paper (1) : << The control of the relative amounts of the backflow and forward flow means the control of the total apparent resistance. In the situation of zero apparent resistance, the two flows are nonzero but balanced, such that the voltage across the flow region is zero. The current loops in this region suggest the possibility of interesting and electromagnetic effects. Today, my primary objective ( a close replication of the Chung's experiment done in 1998 ) is now reached. Now, I need to think and focus on the understanding of this very interesting phenomenon. I shall keep you informed about my progress in this field of research through this web page : http://jnaudin.free.fr/cnr/. Thanks you very much to all for your encouragements and your helpful support.